Carlucci Restaurant in Downers Grove is partnering with Y. Rousseau to bring a gourmet wine dinner to the suburbs. The four-course meal and wine-pairing event takes place on Thursday, October 30 at 6:30 p.m. at Carlucci Restaurant. For $75, guests get to dine on Carlucci’s Tuscan-inspired cuisine paired with wines from Mount Veeder, Alder Springs Vineyard, Russian River, and Moon Mountain. Guests can read more about Y. Rousseau wines at yrousseauwines.com and can call 630-513-0990 to attend. Full available menu and wine pairing below. WHEN: Thursday, October 30 at 6:30 p.m.
Saturday: 4:30 p.m. – 10:30 p.m.
Sunday: 4:30 p.m. – 9:30 p.m.
Bar remains open until close. Carlucci, a popular suburban dining destination, intertwines good food and a lively, entertaining and comfortable atmosphere. In addition to enjoying seasonally influenced dishes by Executive Chef Jonathan Harootunian, guests can hear live music on Thursdays and Saturdays by Stark Raving Dad, The Mix, Ready R Knot, and more. October is Breast Cancer Awareness Month and Carlucci in Downers Grove aims to do their part to combat the disease with promotions all month long. Throughout October, Carlucci will have their “Pink Table” available for reservations. Anyone that dines at the Table, adorned in a pink tablecloth, will have 10% of their dinner check donated by Carlucci to the Breast Cancer Research Foundation. Guests can reserve the table in advance or dine at the table when available without reservations. On Thursday, October 9 at 6 p.m., Carlucci will host a benefit event in partnership with ArteFill and Allure Skin & Laser Center. For $20 per attendee, guests will receive a complimentary dinner buffet and cash bar while learning about the longest lasting dermal filler and the newest FDA approved Regenica Skincare. It is a live demonstration and proceeds go to benefit the Breast Cancer Foundation. Space is limited to 30 people. RSVP by calling 630-818-7546. COST: No additional costs to guests; 10% of dinner checks at the table get donated to the Breast Cancer Research Foundation. RESERVATIONS: Call 630-512-0990 for reservations. Walk-ins can participate if table is available. WHEN: Thursday, October 9 at 6 p.m.
RESERVATIONS: RSVP by calling 630-818-7546. Space is limited to 30 people. Guests can celebrate the warmer weather on the patio at Carlucci Restaurant for its summer kickoff party while enjoying live music, cocktails and a dinner buffet. There will be 12 different cocktail stations each featuring 2-3 unique martinis and summer cocktails.The buffet will feature signature menu items including Caprese Salad, Bocci Balls Arancini (breaded, deep fried risotto balls with fresh mozzarella, pecorino, and peas with a tomato sauce), Squeeze Box Con Pollo (radiator pasta with chicken, broccoli and red peppers in a roasted garlic cream sauce), Pizza, Chicken Piccata and Grilled Salmon. Photos available upon request. COST: $30 Includes buffet and 3 drink tickets. Additional drinks are $5 each. 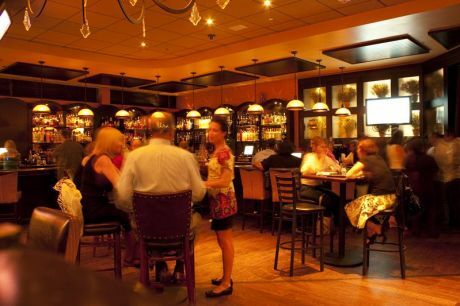 Guests are invited to enjoy live music at Carlucci Restaurant in Downers Grove every Thursday from 7:00 PM to 11:00 PM and Saturday from 8:00 PM to 12:00 AM. Their new December music lineup features entertainment by Soda, Brill Babies, The Band Sundance, Frank and Dave and more. Carlucci will host a special New Year’s celebration on Saturday, December 31 from 8:00 PM to 1:00 AM featuring live entertainment, cocktails, dinner, dancing, party favors, a champagne toast and entertainment provided by The Niche. $75 per person includes tax and gratuity, two drink tickets (followed by a cash bar), and a full buffet complete with appetizers, salads, pastas, entrees, carved prime rib and desserts. Tickets can be purchased by calling the restaurant.